With its Retina display, unmatched ecosystem of HD video content, and AirPlay streaming capabilities, the iPad is undeniably one of the best experiences for watching video on a mobile device. The one glaring omission from Apple’s recipe for the perfect mobile video experience, however, is the absence of quality, front-facing speakers. The result is a sound experience that doesn’t quite live up to HD content on the iPad’s best in class Retina display. With several newer devices (see: Galaxy Tab 2, HTC One) adding front-facing, stereo speakers, audio performance is clearly one area Apple is falling behind, and its competitors have certainly taken note. The Thunderstorm resembles your average plastic shell iPad case and comes with most of the bells and whistles including cutouts for your iPad’s rear camera, headphone jack, microphone, etc. The bottom half of the case is made out of a smooth, matte black plastic, while on the front you see a landscaped oriented, aluminium speaker grill running along one side of the case. 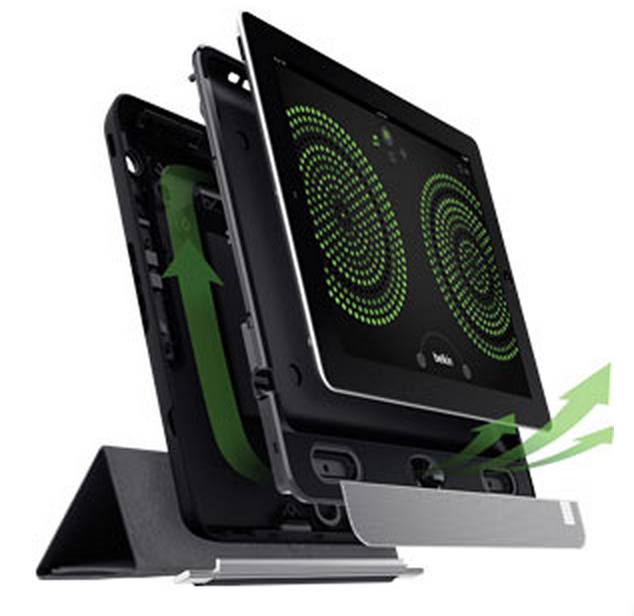 Belkin also includes a Smart Cover-like front panel that attaches magnetically to the case itself, includes a cutout for the speaker, and also folds origami-style to prop up the device at two different viewing angles. 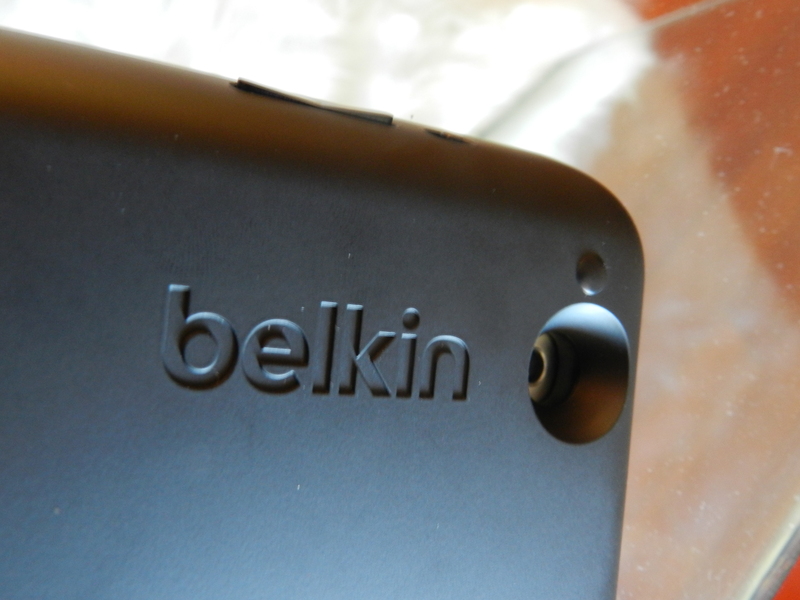 Apart from a rather flimsy plastic volume rocker, nothing about the case feels cheap, as to be expected from Belkin. The big difference is an integrated 30-pin or Lightning connector that slides into place and connects your iPad to the built-in speaker after the device is placed in the plastic shell. It also includes a battery that provides up to 10 hours battery life for the Thunderstorm. In my eyes the real benefit of building a quality portable speaker solution directly into an iPad case is portability. 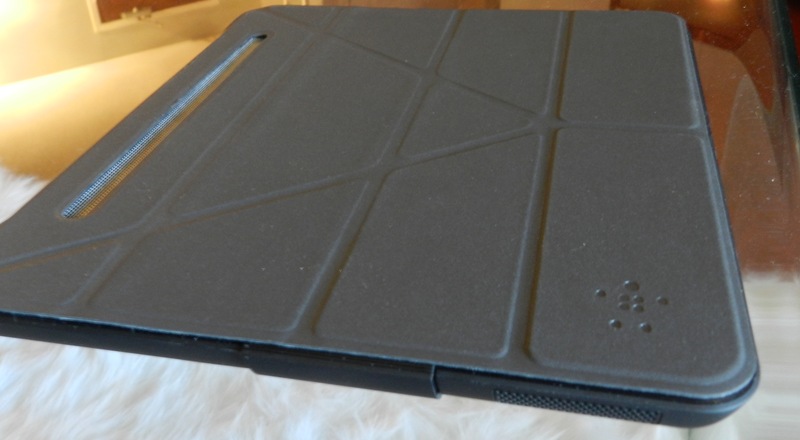 A large percentage of iPad users opt for a protective case anyway, and you effectively replace your iPad’s speaker dock and or the hassle of lugging around a portable bluetooth speaker. The real question is, how does it sound? Sound performance|The Thunderstorm certainly isn’t going to replace your expensive home theater solution and its real shining point isn’t how loud it is. On the other hand I was truly shocked at the sound quality, which has clearly been optimized for viewing movies, in comparison to comparably priced Bluetooth speakers. It might not be quite as loud as other $100-$200 speakers, but that doesn’t mean it’s not as powerful. Belkin has managed to pack some serious low end in the Thunderstorm’s rather small ported enclosure. It’s most noticeable when watching movies, with rumbling lows and clear mids that do an excellent job of simulating the audio experience you’d get at the theater. Belkin didn’t do it alone, it’s getting help from Audifi’s sound processor to integrate iPad docking, ultra-low distortion and power-efficient amplification, and a small acoustic chamber that Audifi says is key to the experience. Belkin’s home theatre experience doesn’t just end with superb sound quality. There’s something to be said for the integrated air channels that Belkin explained “allow optimal airflow so bass frequencies come alive.” This is the first thing that most people will notice when first watching video with the Thunderstorm, the rumbling and vibrations of the audio can be quite intense and truly gives the impression of a theater-like experience. That’s something you just don’t get with a price comparable Bluetooth speaker, and was a unique experience with the iPad that we quite enjoyed. It’s also something that added a new dimension to gaming and is comparable to vibration features console makers have used in gaming controllers. Companion app|Belkin and Audifi have also created an app called Belkin Thunder that allow users to create customized soundscapes “with a simulated middle channel to lend clarity and presence to dialogue.” You can see it in action at the end of the video above. Design|One thing that can’t be overlooked is the Thunderstorm’s size. its rather bulky at 20 x 5 x 15 inches, and weighs about as much as an iPad itself at 1.4lbs. It’s clearly bigger than other iPad cases, but you’ll be hard pressed to find a standalone bluetooth speaker as crisp and powerful that is much smaller. The size and weight honestly didn’t bother me when using the Thunderstorm, which in my case was mostly during travel and in hotel rooms. The added weight is comparable to carrying around a bluetooth speaker, but for many users this won’t be a case for everyday use. If the second generation Thunderstorm could shed some weight, i’d have no problem keeping the case on my iPad at all times. Should you buy it?|In recent years portable Bluetooth speakers have become the go-to solution for many, with less and less companies focusing on building dedicated docks for iOS devices, and especially for iPad. They connect to any device, regardless of new I/O standards, and many of our favorite sub $200 solutions are as portable as the iPad itself with long-lasting batteries and surprisingly great sound quality for their compact form factors. 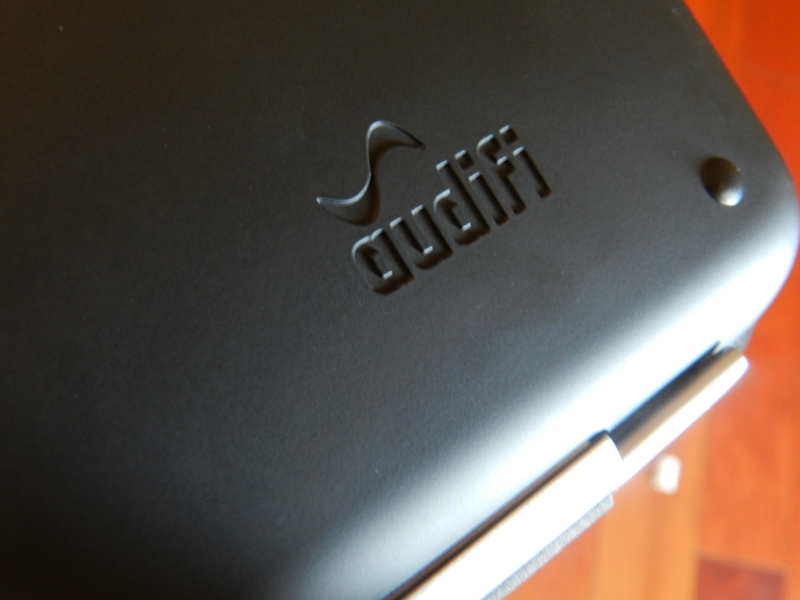 Despite that, I think Belkin and Audifi are really onto something. I’ve tried many Bluetooth speakers from Logitech, Jawbone, NYNE, JBL and more, and I can honestly say none quite compare to Thunderstorm when it comes to a rich, immersive sound experience for watching video on an iPad. Its a unique experience with Thunderstorm, fine tuned specifically for the movie watching experience, and it’s definitely worth your attention if much of your time with an iPad is spent watching video. The Thunderstorm is clearly for the iPad user that watches a lot of movies, and for them I don’t hesitate to recommend dropping the $199 Belkin is asking for the product. Amazon has the Belkin Thunderstorm Handheld Home Theater for $199 with free shipping.